Trying peated whisky for the first time, Curly? Without delving too deeply into the metaphysical woods, many religions also have the rule of three as a part of their beliefs and symbols. Some pagans and wiccans believe in the Rule of Three (whatever energy a person puts out into the world, positive or negative, will be returned to that person threefold), Catholics have the Holy Trinity, the three theological virtues (faith, hope, and charity), the Vikings had the Horn Triskelion and the Valknut, and there are countless other examples. So it should come as no surprise that whisky marketing has jumped on this bandwagon as well. Canadian Club labels its nine year old whisky as "Triple Aged", Bushmills Irish Whiskey makes liberal use of the fact that their single malt is "Triple Distilled", and Laphroaig's core lineup features an expression called Triple Wood. 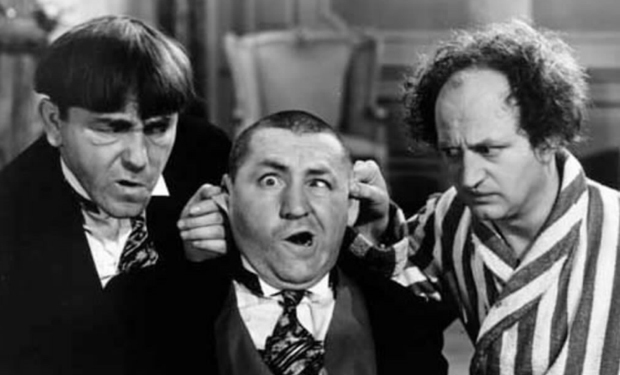 So what's it all about? 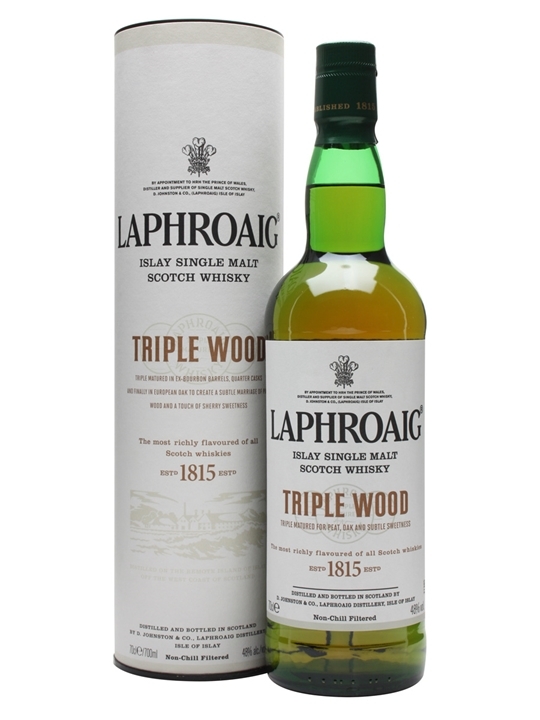 Triple Wood is an extension of Laphroaig Quarter Cask. Like Quarter Cask, Triple Wood is matured for 5-11 years in ex-bourbon American oak casks from Maker's Mark (200 litres) and is then transferred to smaller (125 litre) American oak Quarter Casks for about 8 to 9 months. Triple Wood then adds another maturation, this one done in sherry-seasoned European Oak. Triple Wood is matured for one year in first fill Oloroso sherry butts and two years in refill sherry butts (approximately 475 litres). So using my superior math skills, I can deduce that Triple Wood is a vatting of whiskies that are 8-14 years old, with most probably being 10-11 years old. That last part is just a guess. Nose (undiluted): deep earthy peat, campfire smoke, fruitiness (plums and apricots), nuttiness, and sweet vanilla sitting on top. There’s far less iodine (seaweed) and brine than you’d expect from Laphroaig but it’s there in the background. Terrific nose. With water, the iodine rushes forward and imposes itself alongside a menthol note. Much less fruity flavour with water added as well; instead there’s more ashy peat, vanilla and brine. The meatiness is not quite as present with water added. I prefer this one neat, though it is still pleasant with water added. There was little to no alcohol burn, so adding water is unnecessary. It's worth noting that Laphroaig Triple Wood is bottled at natural colour. That's right, there's no "fake tan" from any added E150a (caramel colouring) in this whisky. It's a lovely gold colour which comes entirely from the casks. It's a step in the right direction. You can check out Laphroaig's distillery manager, John Campbell, talking about Triple Wood here if you want more information, or if you just want to hear someone with a Scottish accent talking about Laphroaig. It's no secret that I'm a huge fan of Laphroaig. I've never tried one I didn't like, though I like some more than others. The Laphroaig 10 Year Old Cask Strength is my all-time favourite and I'm disappointed it isn't available in Ontario because it's fantastic. Laphroaig Triple Wood isn't that far behind, though. It's balanced, it's complex, and all the flavours are in terrific harmony. I think I prefer Triple Wood to the standard 43% ABV bottling of Laphroaig 10 Year Old. Very highly recommended.